Sticking around Los Angeles for Spring Break?? 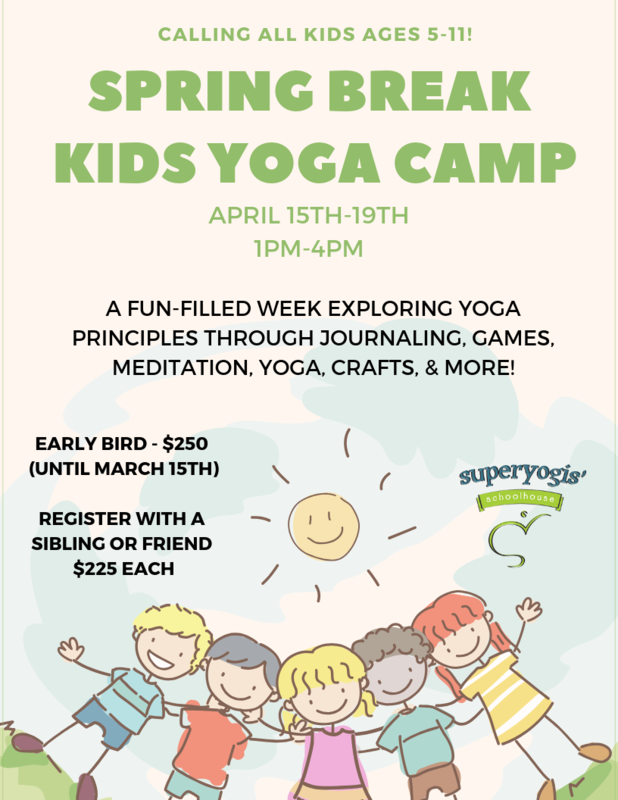 Enroll your child in Kids Yoga Camp! This fun-filled week will include games, meditation, crafts, yoga and more. Enjoy our early bird rate through March 15, 2019 and enroll with a sibling or friend for an additional discount! Full Week - Early Bird until March 15th, $250 per child. Full Week - Enroll with a sibling or friend, $225 per child. Single Day Rate - $75 per child. 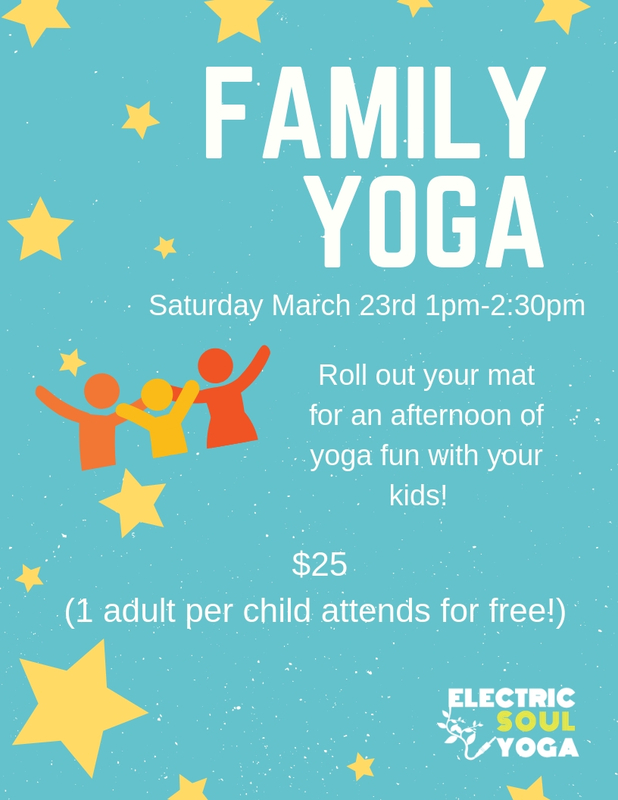 Roll out your mat for an afternoon of yoga fun with your kids! Have you been looking for that one thing that will make all the difference in your life? The key to allowing you to stop looking back at a dead past and worrying about an unborn future? Life and Yoga Teacher Training with Eric and Rina can help you find deeper meaning and flourish with confidence and strength. This training is not just for people who want to become yoga teachers but for anyone who wants to excel in their life! Lectures: A series of interactive discussions that center on yoga, what life is, karma, destiny, relationships, etc. Exploration Exercises: Activities designed to inspire you to take dynamic action in the moment, all through your life. Through individual and partner exercises, we will explore beliefs, barriers and boundaries that will help us break through mental blocks that tend to hold us back from being our best and living the life we want to live. Action Adventure: Activities that engage you off the yoga mat on a daily basis and which serve as motivation for the personal work we need to do. Sharing Circles: A safe space to let out feelings, emotions, and stories, and a space for others to receive and support us as we are: raw, authentic, courageous. Payment Plan and Scholarship Options are available contact manager@electricsoul.yoga for details. *Limited Time Offer. Active Students only. Contact us for restrictions. Mastering the Art of Yoga Photography: Be the Model and/or Be the Photographer! Discover the secrets of how to make powerful, poetic images celebrating the beautiful art of yoga. 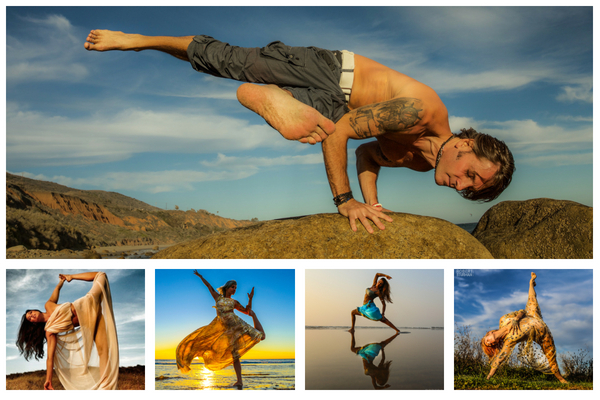 Aspiring models and yogis: learn what it takes to get great pictures. Photography enthusiasts: learn about composition, balance, integration of the pose with the environment, connecting with the model, and much more. Come be the photographer, model, artist, muse--or all of the above. Bring your camera, phone, questions, and curiosity. The first half of the workshop will be inside. In the second half, we'll venture outside into the natural daylight. Lecture with interactive photo shoots. One of the many aims of a Yogi is correct positioning. This applies to physical asana but the body's position is only a small part of what "being in the correct position means." June 30th we are holding a yogathon (don't worry it's not as grueling as it sounds). We all are in a position to help. The helping pose is one where our efforts and resources contribute directly to someone else's life. That life is one of a child. St Jude's is the foremost hospital in the world. The treatment is like no other. The children and their families pay for nothing all because of us! Whenever minimum effort goes a long way it's a home run. All you need to do is what you love doing; come take class. Donate what you can financially or start a team of your own. This my dear friends, is what the yogis call a no-brainer. All the work a Yogi does on herself is for helping others. It's an honor to be in this community with you. A joy to share class with you but most of all we keep saving each other! On the 30th we sweat it out to save those who can't help themselves. We are happy to be a partner of the 1st Annual Mammoth Yoga Festival in beautiful Mammoth Lakes, CA June 14-17, 2018. Join Rina Jakubowicz and other renowned teachers in one of the world's most iconic places with breathtaking views that will shift your perspective. Payment plan options available upon request. Contact info@electricosul.yoga for details. Join us for a life changing journey on the exotic coast lines of Chacala, Mexico and the heavenly Mar De Jade Spa and eco chic hotel. If you’ve been looking for the one thing that will make all the difference in your life, then this experience is for you. - Partake in lectures on the entire scope of Yoga Philosophy and practice. - Experience exploration exercises that challenge lifelong belief patterns. That’s why I’m thrilled to bring my kids yoga teacher training program to Electric Soul Yoga. Yoga benefits children in so many ways. Are you a yoga teacher or student starving for the truth? Are you sick of the yoga fluff and all the contradicting information? Are you willing to do what it takes to seek this truth? There’s so much clutter to decipher and to cut away. But how do we do that? This weekend will help you become the real deal yourself. No fancy whistles and bells. No extra sugar coating. We will bite right into what we need to learn to become “super”-human. The quantity of training never made anyone a great teacher. Only the quality matters. If you’re looking to take your practice to a deeper level, this new weekend training is specially built for the hungry student who wants more, both physically and philosophically. Contact Rina at Rina@rinayoga.com for more questions. Have you been looking for that one thing that will make all the difference in your life? The key to allowing you to stop looking back at a dead past and worrying about an unborn future? Life and Yoga Teacher Training with Eric and Rina can help you find deeper meaning and flourish with confidence and strength. This training is not just for people who want to become yoga teachers but for anyone who wants to excel in their lives! Bright, assertive and fiery movements paired with passive, soft and feminine movements are the dynamic practice of vinyasa and yin yoga! Join Kimberly, aka Yinberly, the dynamic teacher that matches this practice for an evening of movement, restoration, transformation and connection!